Christmas Gift Ideas for Cooks and Foodies – Get Cooking! What do I have that I know other cooks and foodies would love? What would I love to open on Christmas morning, myself?! TJMaxx gets me. They just really, really get me. So much so that they’re often a few feet ahead of me when it comes to knowing what I need. Honestly, I’ve lost track of the times I’ve meandered through the store and found things I had no idea I needed! Which is exactly why when any of my daughters and I go, we allow time for at least an hour of wandering and shopping. The males in our family seldom are up for this – except for the 10 month old. He doesn’t have much of a choice. The Core Kitchen Cookware Protector Set (link to other Core Kitchen Protector Sets on Amazon) jumped out at me on a recent trip. The bright colors caught my eye and I had to take a closer look. Each set comes with three colorful cookware (or plates, bowls…) protectors. They’re designed in a way to simply and beautifully cushion your pans or dishes and protect them from scratches. I wish I’d had these many, many, many scratched pans ago. 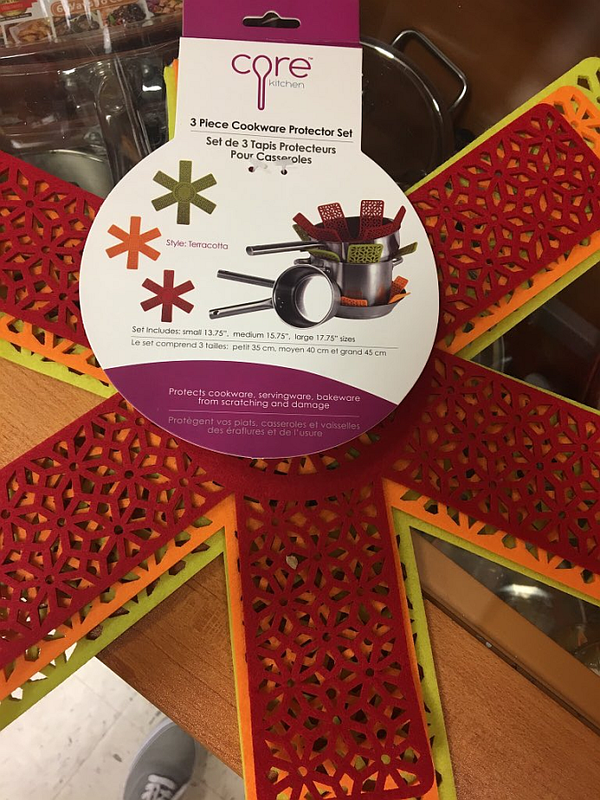 If you live near a TJMaxx, look for these beauties – they’d make brilliant additions to your own home as well as fun and useful gift ideas for the cooks in your life. There are also many different color combinations available on Amazon. All I Need Today is a Little Bit of Coffee and A Whole Lot of Jesus… AMEN! Obsessed. That’s what I have become with Primitives by Kathy on Amazon. The wonderful humor, love of life, and adorable images… seriously, I cannot get enough of it. So many people on my Christmas list are getting gifts with Primitives by Kathy tags on them! I’d be lying if I said I haven’t ordered any for myself. Shhhh, don’t tell. The towel pictured above is on its way to my home and it may or not be another one for me. What can I say? It’s my motto. In fact, if it mentioned cats, old movies, baseball and chocolate I’d swear it were made for me personally. Click through to take a closer look at the Primitives by Kathy Coffee & Jesus Towel. Her towels are selling like crazy – and I swear I’m not the only one buying them up! P.S. Don’t tell, but I definitely got this one for one of my daughters. If I haven’t mentioned it here, it’s the only place I haven’t mentioned it and you’re the only ones I haven’t told…. our first grandbaby (a boy) is due in a matter of weeks and we are completely over the moon. As someone who had all daughters (three to be exact), I can’t wait to see what it’s like to have a little boy in the family. I’ve been brushing up on my dinosaurs (ever notice how many kinds there are… trust me there are A LOT) so I can impress him with my knowledge. Just so you know, I plan to be the coolest MiMi in the world. These adorable Dinosaur Taco Holders are just the thing for any other cool moms, dads, grandmoms, granddads, aunts, or uncles who want to score points with the little ones. Let me just say, right up front, that many little girls LOVE dinosaurs just as much as (or even more than) little boys. They’re fascinating! My own daughters, while they loved (and love) animals to distraction, were simply never into dinosaurs . Dragons? Absolutely. But dinosaurs, not so much. If you have little boys or girls in your family who’d get a kick out of these taco holders, they’re available on Amazon. While they’d make fun Christmas gifts, I think they’d be just as fun to have at your house for extra, extra cool lunches.. as well as extra “cool points” for yourself. Food-Inspired Rattles for Toddlers and Babies… These Are Adorable! Pebble Food RattlesAs a food blogger, I almost always have food on the brain. As a mom of three (and soon to be grandmother to a precious baby boy, who’ll be arriving in January! ), I always have children and babies on my mind too. 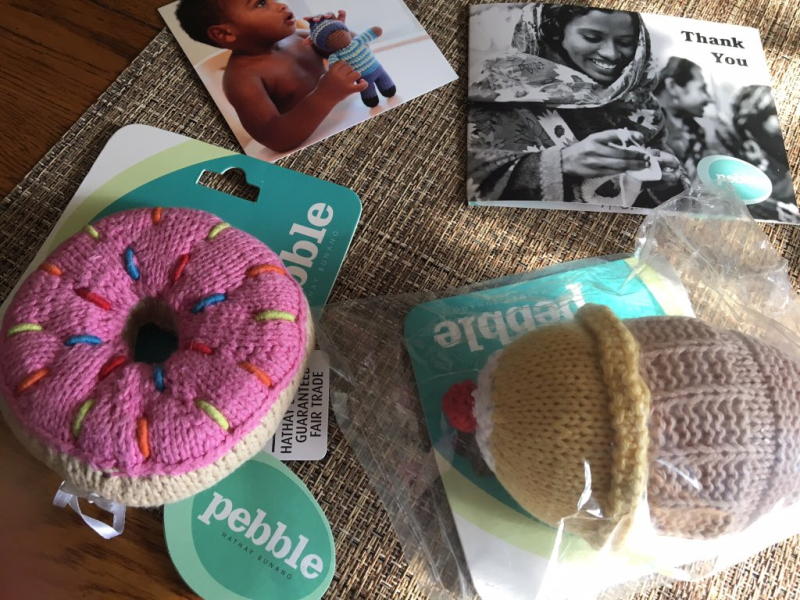 Pebbles by Kahiniwalla has entered the picture and combines these great loves in one place! 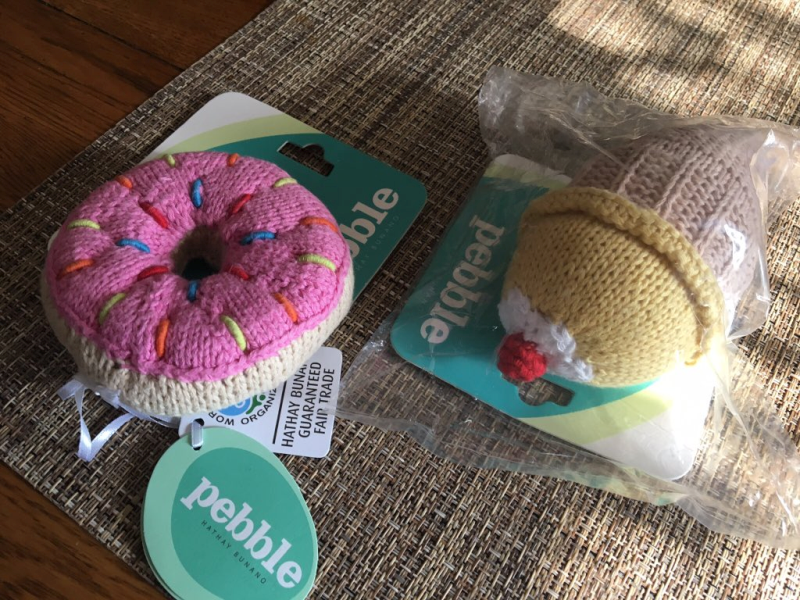 They have the most adorable food-inspired toys that you and the precious children in your life will love. The adorable food rattles include Avocados, Watermelons, Doughnuts, Ice Cream Cones, Mushrooms and many more. I was sent the two colorful beauties you see here so I could familiarize myself with the rattles before telling you all about them. My first grandbaby already has two toy rattles and he isn’t much bigger than they are…… yet. 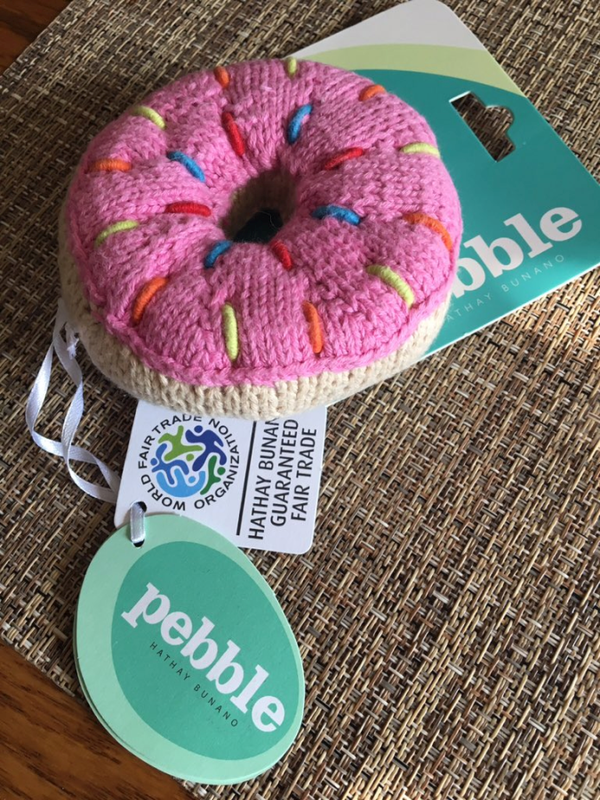 All Pebble toys are made of 100% cotton. They are machine washable and can be tumble-dried on a low setting. 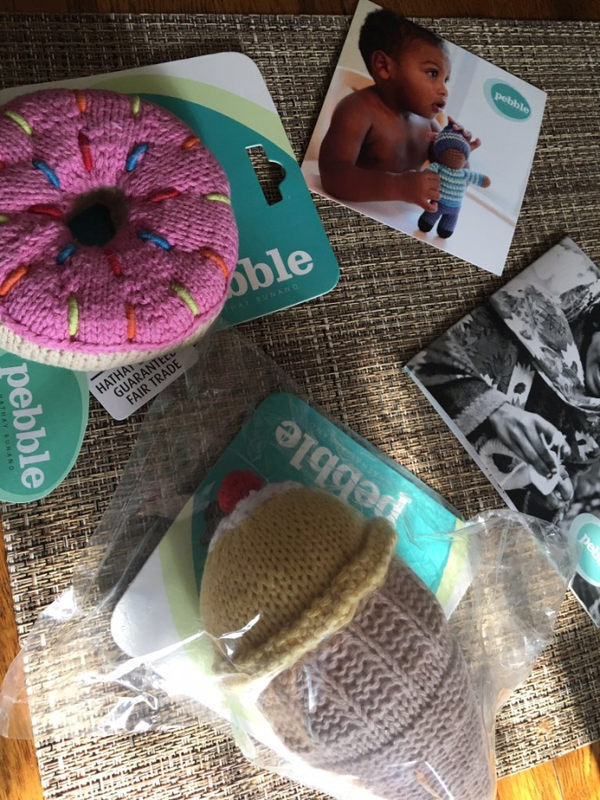 Fruit and vegetable rattles were some of the first designs by Pebble. Children became enchanted with the bright colors and rattle bells. Food rattles appeal to babies and toddlers alike. Infants and babies are intrigued by the rattle of the bell and they are easy to grab and chew. The older, toddler-age kids can play make-believe with the food rattles in their toy supermarket or kitchen. All Pebble products are made by Hathay Bunano. Hathay Bunano, meaning handmade or hand-knitted in Bangla, is a non-profit fair trade organisation in Bangladesh. It’s mission is to create fairly paid, good quality, flexible and local employment for rural women who are poor and often disadvantaged. Hathay Bunano aims to provide employment which fits in with the rhythm of rural life and to prevent economic migration to the cities. It aims to keep families together and in particular to keep mummies with their babies and children by providing employment in a village setting close to their homes. It aims to address all the reasons why a woman might not be able to work and to support her so that she can work and can earn money to support her family. These beautiful rattles are the highest quality and I’m totally in love with their bright colors. They’re soft and just the right size for little hands. I absolutley recommend visiting Pebble Child and seeing their complete collection of gorgeous toys. You can browse all of the adorable food rattles and pick your own favorites. A lot of Pebble Rattles are also available on Amazon! Learn more about Pebble by Kahiniwalla at http://kahiniwalla.com and http://www.pebblechild.com/. The beautiful 2-Quart Certified International Tequila Sunrise Bean Pot, pictured above, is at the top of my list of “must haves.” As an cook, I love surrounding myself with the best pots, pans, gadgets, and tools possible. As a food blogger and food photographer, I like for everything to be as pretty as Ava Gardner in a red dress… or as close as they can possibly get. See Certified International Tequila Sunrise Bean Pot for more information and a closer look. Gorgeous! 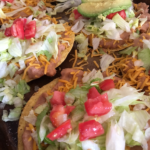 A few days ago, I was taking a few pictures for the food blog and it occurred to me…. most of my dishes and a lot of my gadgets and small kitchen appliances come from Target! Somewhere along the way, Target stepped up to be one of the best places for buying dishes, kitchen gadgets and small kitchen appliances – and, it would appear, pretty much my “go to” place for each. While I have a gazillion and seven things lined up to do today, I HAD to take a few minutes to tell you about a few special savings events going on and coming up on Target’s website. From the 18th (this Sunday) – the 24th (next Saturday): You can take an extra 25% off anything you buy in the Kitchen department by using the code KITCHEN when checking out. While I’m wild at the thought of saving 25% (that ends up saving a lot of money), I think I’m even more excited by the thought of a 15$ gift card. More dishes! 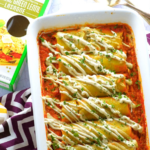 Click through the link above or any of the images to see all the wonderful things in Target’s online Kitchen Department. Also… while this isn’t remotely “kitchen” or “foodie” related (unless, of course, we’re talking about taking great food pics), Target also has another crazy deal going on from the 18th -24th: Earn yourself a Free $200 gift card when you buy an iPhone 7! Do you have ANY idea how many dishes you could buy with a $200 gift card?? I can’t decide which I love more about this beautiful Stoneware Honey Pot from Le Creuset – the gorgeous Dijon color, the name Le Creuset on the dipper, the bee on the front, or its overall great looks. I’m calling it a tie and I’m calling it something I need in my kitchen badly. If you order soon, you can still have this Stoneware Honey Pot delivered by Christmas. Le Creuset has an unreal number of gorgeous stoneware lovelies for the kitchen – many of which are also available in this Dijon color. Or, if you’re like me and pretty much go with every color of the rainbow, that’s more than possible too! Inevitably, after months of shopping and planning, my best-received gifts are the cookies and candies I’ve made for my loved ones. That’s why, in the days leading up to Christmas, you can only find me if you look in my kitchen. I’m the one covered in powdered sugar, chocolate, and corn syrup – dancing around to Christmas music. Man, I love this time of year! If you love giving gifts you’ve made in your own kitchen, too, here’s a cookbook you’ll want to add to your library right away. Gifts from the Kitchen: 100 Irresistible Homemade Presents for Every Occasion, by Annie Rigg, is an uncommonly beautiful book. 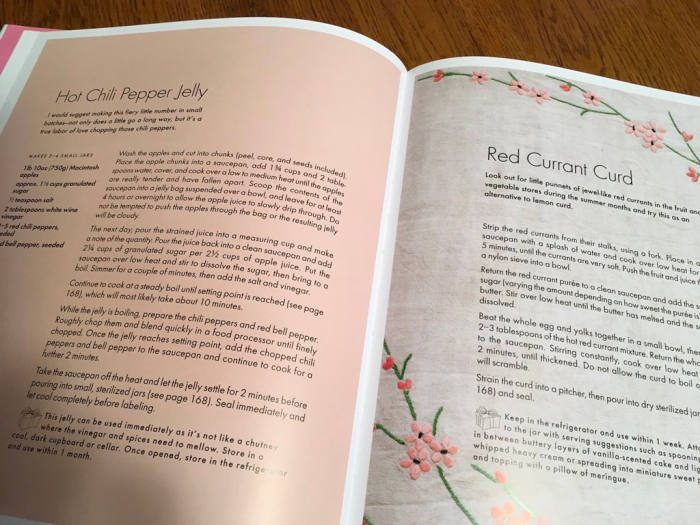 As a cookbook collector, one of the first things I notice about a cookbook is how good it feels about itself – the cover, artwork, and photographs let you know, right off the bat, if the cookbook feels really good about itself or if its heart is only half in it. Gifts from the Kitchen feels amazingly good about itself – we’re talking “supermodel” confidence, here. Naturally, for a book to be a great book – there has to be more than just great looks going for it. Thankfully, Gifts from the Kitchen comes through in the personality department, too – it’s not just a pretty face. While I’m telling you about Gifts from the Kitchen a few weeks before Christmas (timing is everything, guys), this book is actually off the charts useful throughout the year. Why? Because people LOVE homemade gifts all year long! The book covers all celebrations and all seasons. Not only can you use the beautiful delicacies for gift-giving, you can also use them to celebrate special occasions. In addition to the clear and simple recipes, Gifts from the Kitchen provides beautiful examples of ways to present many of these food gifts to your lucky foodie. This is not a “gluten free” cookbook, but many of the candies and other recipes are, in and of themselves, gluten free. I have not tested any of the other recipes with gluten free flours, so I can’t say how well they’d take to substitutions. It is, however, in my opinion, more than worth having in your collection. The candies, spreads, jellies, etc. outnumber the cakes and cupcakes… and even they provide inspiration and ideas for the gluten free cook. I’m especially excited about a recipe for “Wholegrain Honey Mustard.” Wholegrain mustard is an obsession of mine – I add it to more recipes than you can imagine (potato salad, BBQ sauce, deviled eggs, egg salad sandwiches, salad dressings…). I can only imagine how amazing this homemade Wholegrain Honey Mustard will be! See Gifts from the Kitchen for more information. 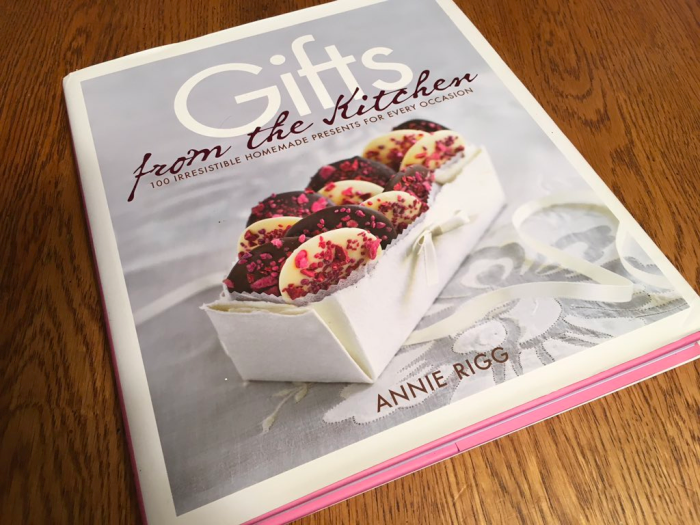 While you’re on Amazon, check out the other beautiful cookbooks by Annie Rigg. 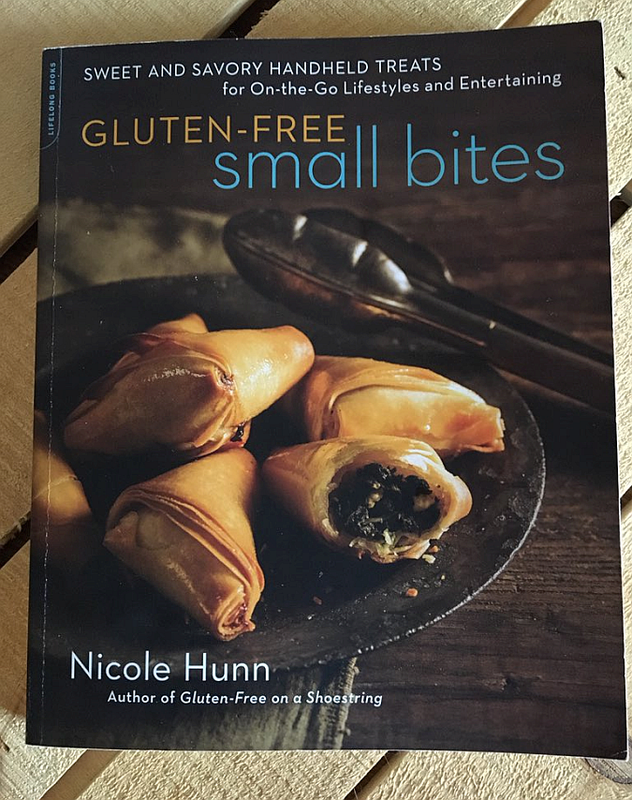 Before I get to my raving-licious review of Nicole Hunn’s newest MUST HAVE gluten-free cookbook, Gluten-Free Small Bites, I just want to publicly thank her for the time and effort she puts into her gluten-free blog (Gluten-Free on a Shoestring), her gluten-free cookbooks, and even her social media accounts. 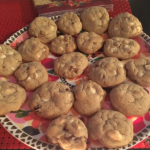 Before I had to give up gluten/wheat nearly four years ago, I had always been known in my family as an avid baker and cook – and (*tosses modesty aside for just a second) and a darn good one. As compliments poured in, I was always thinking of the next bread or cake from scratch I’d make. 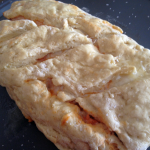 I was known for my sourdough breads, buttermilk biscuits, cakes, pies, cookies, cornbreads, pastries, etc. If we’re being honest, my sourdough bread was legendary. Baking was a major part of my identity. Then… it wasn’t. My body decided gluten/wheat were poison and they had to be permanently removed from my kitchen. I’m not exaggerating when I say that (as a food blogger, restaurant reviewer, and avid cook/baker), my world was rocked and I was in a daze for about a week. If it had not been for blogs like Gluten-Free on a Shoestring, and cookbooks such as the ones Nicole Hunn writes, I might still be in that daze with a ridiculously stupid look on my face. Thank God for these lifelines because I don’t wear stupid well. It wasn’t long before I was, once again, baking bread, making pancakes, cakes, cookies, and even pies. I could make fried chicken again and, trust me, for a Kentuckian, that is huge. The work is sometimes more difficult and, let’s not fool ourselves, it’s usually more expensive to make gluten free recipes than traditional recipes – BUT you can’t really put a price on getting a major part of your identity back. While I don’t have all of them yet, I am in the process of collecting Nicole Hunn’s gluten-free cookbooks. 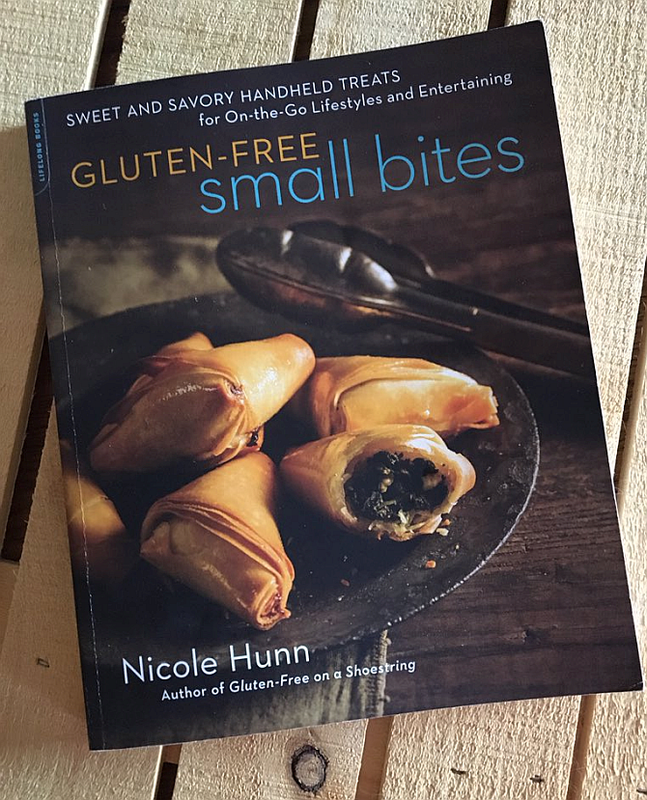 My husband gave me an early Christmas present about a week ago – Nicole Hunn’s newest cookbook, Gluten-Free Small Bites. He handed it to me in the middle of the day and that was that. Not a single thing got done the rest of the day. I escaped to my favorite den chair with iced tea in one hand and my new cookbook in the other. Side note: when you raise three daughters, songs from Disney Princesses become firmly planted inside your brain and they play at pretty random times – at least this time, the song choice was appropriate. Basically, all the things you thought you had to do without eating and live without making are right here in one beautiful book, ready to bring new life back into your cooking and baking. 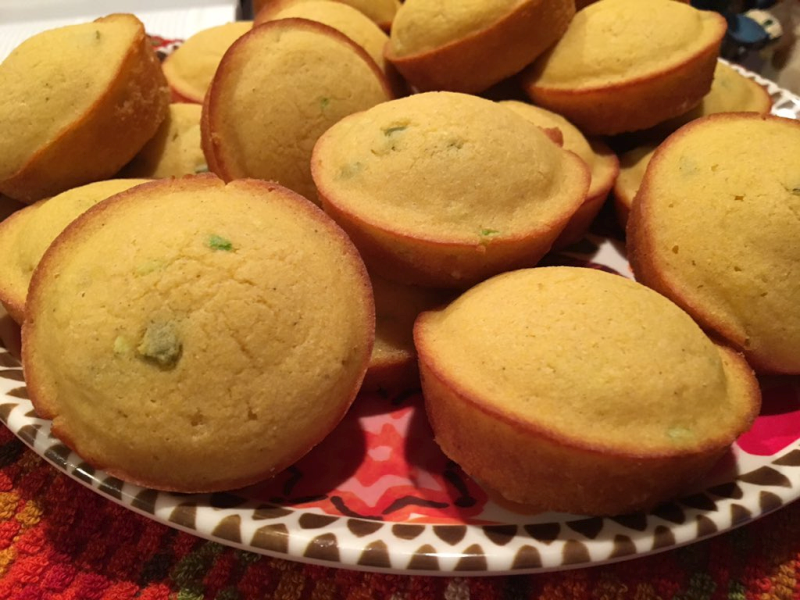 The first recipe from the book that I made were the ridiculously adorable Corn Muffin Bites (page 73). I did not have any corn in my kitchen and since it was pouring down outside, running to the store wasn’t in my game plan. So, I decided to just add a little jalapeno and chopped green onion in place of the corn. 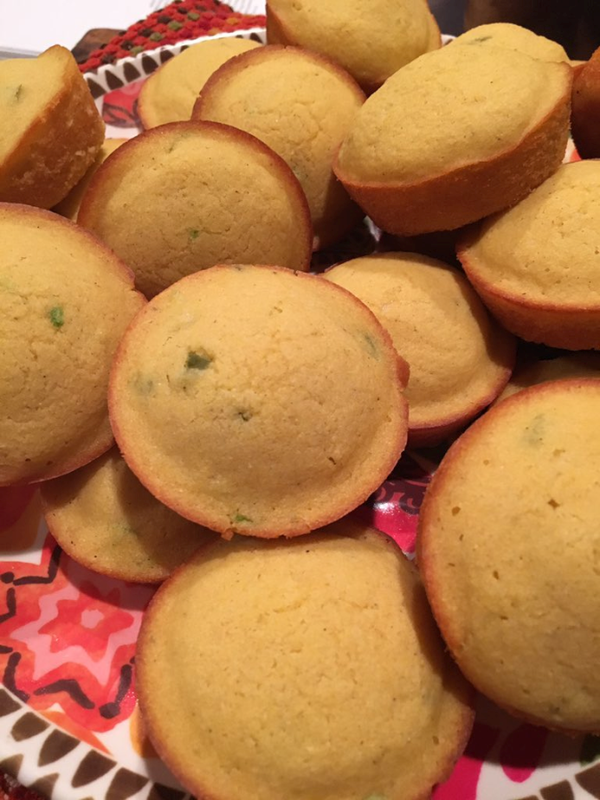 These corn muffins weren’t just beautiful to look at, they were out of this world delicious. I can’t wait to try them with corn next time (although, I’m not lying, the jalapeno and onions were knock outs). I also made them in a traditional muffin pan instead of a mini-muffin pan. Why? Total accident. In my defense, I was under the influence of my allergy meds (Benadryl) and by the time I realized I was greasing the wrong muffin tin, I’d already committed to it. In my state, the thought of re-greasing another pan was out of the question. 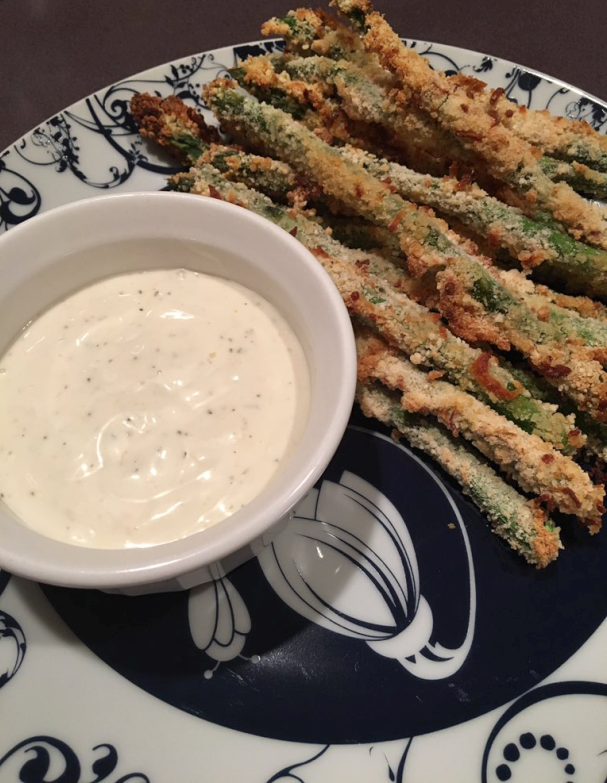 The second recipe I made from Gluten-Free Small Bites were the Asparagus Fries (page 67). I made a ridiculously simple dip for them (Ranch Dressing with Prepared Horseradish and Kosher Salt) and they were unspeakably delicious. Crunchy, fun to eat (and make), and full of flavor. I can’t wait to make both of these recipes again – and to use the Asparagus Fries as inspiration for Green Bean Fries. That’s a classic example of what separates good cookbook authors from great ones – good cookbook authors provide you with recipes, period. 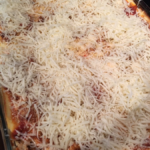 Great ones provide you with recipes, as well as techniques, that inspire confidence and creativity. They encourage you to branch out and try new things and they remind you that cooking isn’t just fun, it’s an adventure! 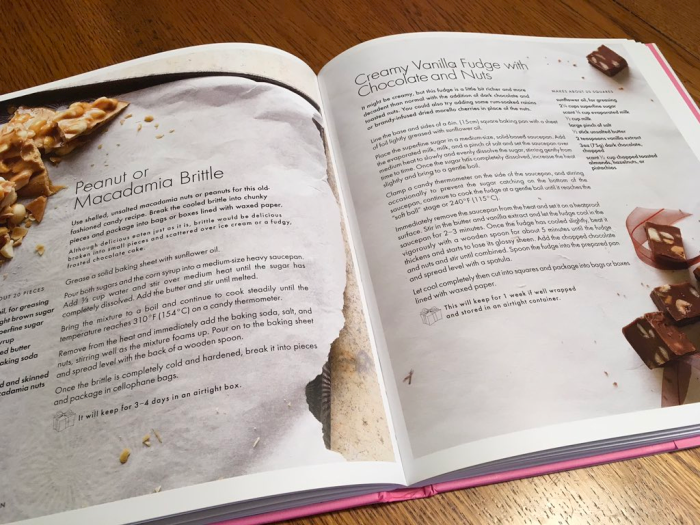 I 110 percent recommend you skip right over to Amazon and grab a copy of Gluten-Free Small Bites for yourself and anyone on your life who is gluten-free. If you need a little more inspiration, go back to the section above that lists some of the recipes included in this cookbook. Then remind yourself that these are just SOME of the recipes in this cookbook. Recipes and experiences that I, for one, thought were gone forever. Reunions are a beautiful, beautiful thing. Find Gluten-Free Small Bites on Amazon. 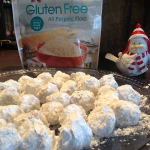 Find Nicole Hunn at Gluten-Free on a Shoestring!